The JRTCA annually sanctions over 60 terrier trials across the country. If you love outdoor action, competition, dogs and down-to-earth socializing, JRTCA trials are great fun for all ages. JRTCA trials feature competitions in conformation, racing, agility, obedience, hunting trials (including go-to-ground and trailing & locating), special child & youth divisions and fun classes such as costume, dog barrel racing and dog & owner look-a-likes!!! Belle won a costume class as a belly dancer! Ash Creek Luke in a conformation class at the JRTCA National Trial. We can't resist waving the Texas flag! Beau with a dog in go-to-ground. We enjoy traveling to different parts of the country for JRTCA trials and through these dogs have made many wonderful friends all over the US and the United Kingdom. Sharing a passion for these dogs is a great way to make enduring friends. With good friend Judy Moomau in Utah. Our good friends, the Epprights, with High Range Cricket. The JRTCA National Trial, held every October in a lovely park on the Susquehana River in Maryland, is a high point. At the 2000 trial, over 1200 Jack Russells competed making this event by-far the largest single breed competition anywhere in the U.S. and probably the world. 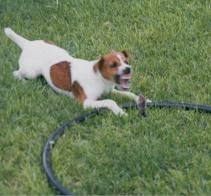 If you are drawn to the Jack Russell, come to a JRTCA trial. 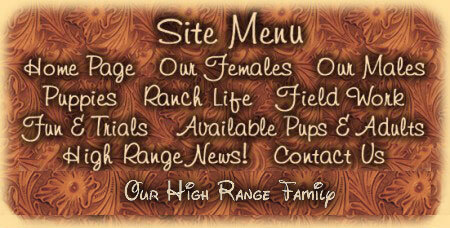 Check the JRTCA web site (terrier.com) for a trial in your area. 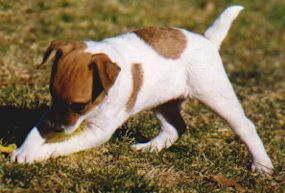 At trials,you will see a great variety of Jack Russells and learn about this unique breed. Jack Russell enthusiasts are an informal lot. We do not use professional handlers at our trials. Jack Russells always are looking for something to do. They love games, athletic endeavors and mental challenges of all kinds. our� Jackson's "span," a critical part of JRT conformation. High Range Dash at his first show. The ribbon is mine and I will carry it!